All three networks, at least in the Chicago market, broken into normal programming with coverage of the arrival of the plane designated as Special Air Mission 41 carrying the body of George H.W. Bush, who died Saturday, Dec. 1, 2018. The plane Bush’ body was on is what most Americans commonly know as Air Force One, but was not carrying the designation at the time because Donald Trump was not on board. Both NBC and CBS also used special opens rather than their normal special report opens, though both included the countdown for affiliate master controls (though it is not visible on the NBC aircheck shown below). CBS and ABC were shortly behind with special reports. 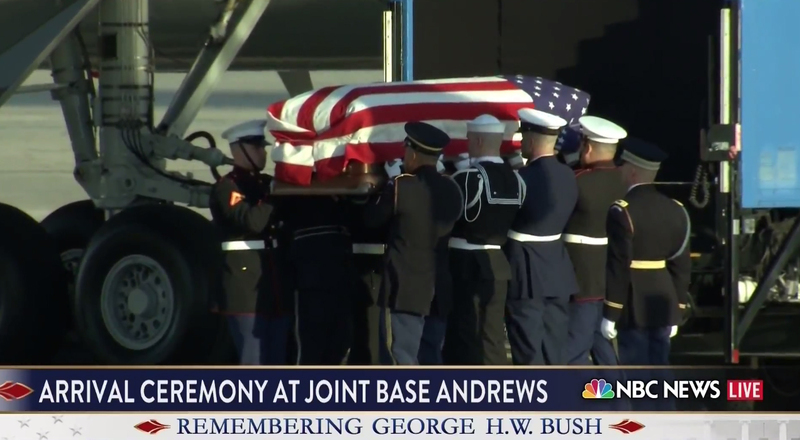 NBC branded under “Remembering George H.W. Bush” and used a similar “lower bar” design and stacked lower third it used for coverage of John McCain’s funeral. CBS stuck with the “President and Patriot” branding it start using Monday morning and altered its world map motit on the countdown in favor of a presidential seal. 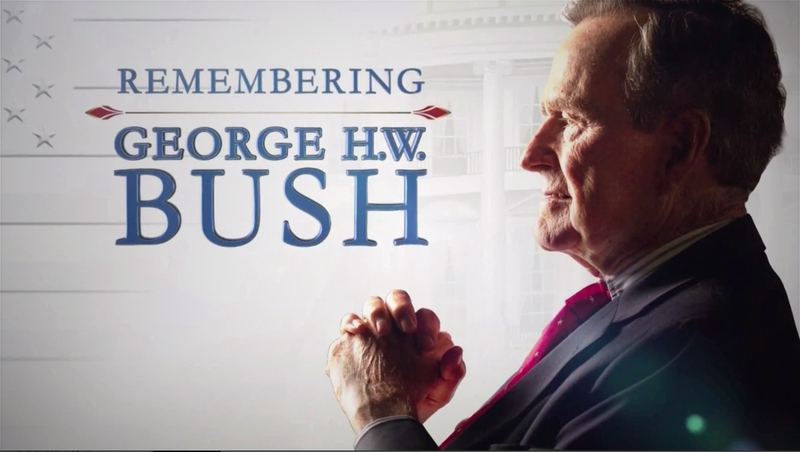 ABC used the first part of its normal open but then added a “Celebrating George H.W. Bush,” thought the announcer added the word “president” and said his full name rather than initials. Correction: An earlier version of this story did not include the fact that ABC News issued a special report.